Wherever you're going, we can take you there! 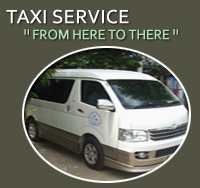 All over central Thailand, we have our different vehicles which can transfer you to and from Kanchanaburi and beyond. We also offer a pick up service from both of Bangkok's Airports, bringing you directly to Pongphen guesthouse. All we need is your name, flight no. and arrival time and we'll be there waiting for you when you land.